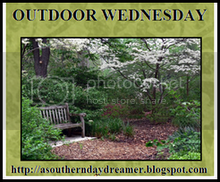 I am joining Susan for her Outdoor Wednesday...and yippee!!! I am not going to tell you it is raining! We have had sun for several days..and the trees I wait for all year... are in bloom.. They are 8 yrs old...little skinny things when we bought them..
Flowering crab apple..no they just get little berries, no crab apples! 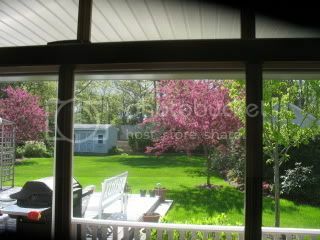 Through my kitchen window..there are 4 of them..the 3 bradford pears have already lost their blossoms. And you will have to tune in next week to see what this outdoor construction will be...shhh, it's a secret! I made Calzone and a salad for dinner last night..
Whatever..it will be great there..our trees are starting to bloom too.. Ain't life grand on sunny days? 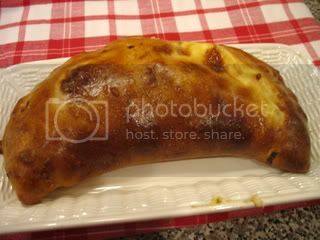 Great photos and yummy looking calzone! Beautiful view and flowering trees. I am looking forward to you sharing your surprise. Thank you for sharing. That crab apple looks amazing! 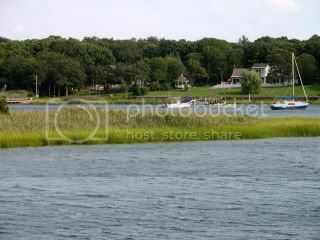 You have the most beautiful backyard with the water view! I can't wait for the surprise to be unveiled. In the meantime I'll settle for a slice of that calzone. 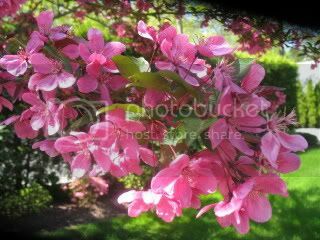 Love the flowering crab apple -- those trees are just so spectacular in spring; I wish they looked like that all summer! Haven't been to the East End yet -- you are giving me withdrawal symptoms. Thanks for visiting and leaving such a nice comment about my daughter and her Bosnia pictures. She is named after my great-grandmother. I'm impressed that your neighbors volunteered in Bosnia -- Alida always came home exhilarated and exhausted! I know what that tree is! I have one and actually, finally knew a name :) Very pretty! and it has been gorgeous out the past few days! I just love those crab apple trees. I am tempted to get one myself. They remind me of crepe myrtle trees..at least in color. The secret is coming a long beautifully.... I'm so glad you're finally getting some decent weather. I think we barely breached 50 today. The crabapple is gorgeous ... definitely makes for a beautiful view. Kathleen, I can't figure out where the osprey nest. The surprise construction is really coming along. Great trees they are beautiful. Lovely pics, thanks for sharing. 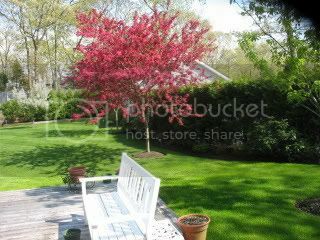 Kathleen, the crabapple tree is lovely, and I love when my neighbor's tree is in bloom. I wish it would rain here, I've been watering my plants with a watering can. Your trees are just gorgeous! I like the Flowering Crabapple. We used to have a REAL Crabapple and I used to have the kids race to see who could pick up the most that had fallen. Otherwise they would rot and we would have bees galore!! You have a wonderful view of your yard from your window. I hope to see more this summer! Have a wonderful week! Oh, the calzone looks out of sight!! 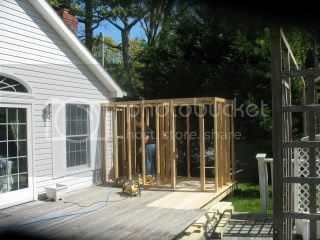 The construction is coming along..faster than inside, huh??? Kathleen, just lovely view from your kitchen. I miss having flowering crabapples. Oh, I didn't know the "project" was going in so quickly! Great! I think we may have the same trees. Are yours Prairie Fires? The get little berries. But, they do not.. drop on the ground? Your yard is lovely.